The very good folks at Across The Pond asked us if we would like to do a weekly preview of some of the shows scheduled for the weekend and we were happy to oblige such a great site as this. So without further a do, let's get underway! On Friday night, HOPE Wrestling are back at the Forest Town Arena in Mansfield, a venue they've really defined as their home in the past year or so. Evolution XXIV: We'll Start a Fire...And Burn Some Bridges is going to see four qualifying matches take place with the winner from each contest earning a place in the six-way HOPE Championship match on July 17th. With qualifying matches such as Martin Kirby vs. Ryan Smile and Joseph Conners vs. T-Bone, the outcomes of each match really are anyone's guess. Elsewhere on the card we have The Hooligans against The London Riots. If you have ever wanted to see a hard-hitting tag team match between two of the finest teams not just in the UK but in Europe then this is the match for you! Saturday is jammed-packed when it comes to shows and we could have a whole article just dedicated to it with events from the top of Scotland to the South of England. However there can only be room for one, well two actually, and the first is ProWrestling Chaos' Heir to the Throne in Bristol. 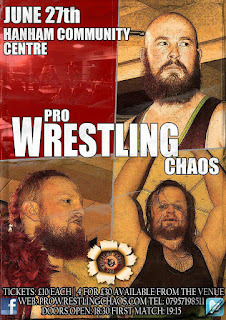 The main event will see Mike Bird defending the King Of Chaos Championship against Eddie Dennis. If you've never seen either Bird or Dennis then you're really missing out on two really talented guys on these shores and the match I almost guarantee to be a cracker. Whoever comes out on top in that match better keep their eye open however as there will also be a six-man Heir To The Throne ladder match with the winner earning a championship match at any time of their choosing. Those two matches plus Morgan Webster in action for the first time since retiring Dave Mercy and earning his roster spot back, Pro Wrestling Chaos are looking primed to deliver another great event. 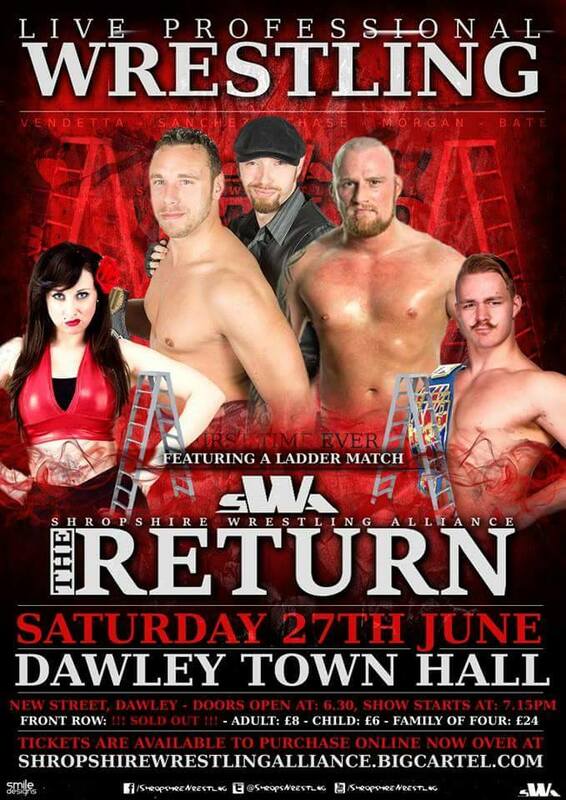 Also on Saturday night, ShropshireWrestling Alliance have their first show for almost 3 months with The Return at the Dawley Town Hall in Telford. Now if you are unfamiliar with SWA then the best way we could describe them is to say they are the future. 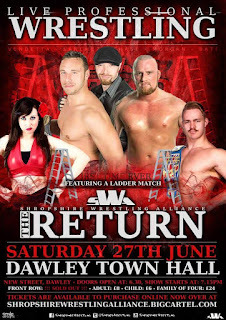 Their shows are packed with some of the hottest young wrestlers in the UK and their show this weekend is no different. Firstly we have Tyler Bate defending the British Lions Championship against Dan Moloney. Now if you wanted a match that showcased young talent in the UK then this is that match. Both of these men have been tearing it up in the last year or so in the UK and neither man is even in their 20s yet. There's also an SWA Heavyweight Championship ladder match between Joey Sanchez & Edwards in SWA's ongoing war with The Chase Coalition. With the added stipulation that if Edwards loses he's gone from SWA, there is a lot more on the line than the championship. In another intriguing match, Damian Dunne & Chris Ridgeway will be in a tag team action against Chris Brookes and.... well we don't know! The only person who does know Brookes' partner is Chris Brookes himself! Add in matches involving Ryan Smile, Chuck Cyrus, Marc Morgan plus big announcements for SWA's July 25th show and you have a stacked night in Telford. Now traditionally Sunday is a day of rest.... except in British Wrestling. 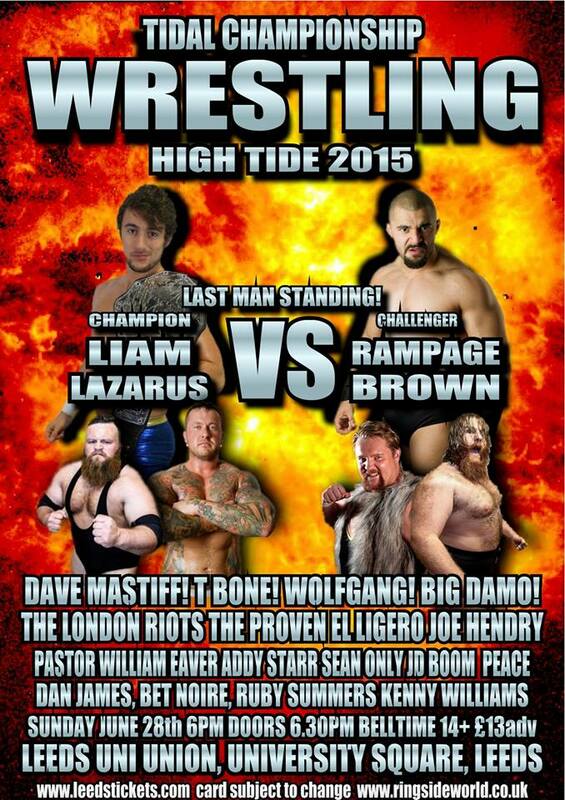 This Sunday will see Tidal Championship Wrestling's latest show, High Tide, takes place in Leeds. There is only one way to describe this show. Violent. Firstly there will be possibly the biggest, heaviest Falls Count Anywhere match ever when Big Damo & Wolfgang face T-Bone & Dave Mastiff in a rematch from earlier this year. If that wasn't enough, we also have JD Boom facing Addy Starr. Now you might not think that sounds all that violent but this match will be a barefoot Lego match! Oh and the fans can bring their own Lego creations as well! However, Tidal Wrestling didn't think that was enough violence as we shall witness Rampage Brown vs. Liam Lazarus for the Tidal Championship in a Last Man Standing match. Now these two men don't dislike each other, they straight out hate each other! 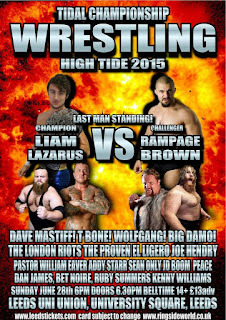 Then you add in matches like The Proven vs The London Riots, Pastor William Eaver, Joseph Conners, Joe Hendry & Sean Only in a four-way match and Ruby Summers facing Bete Noire who is affectionately referred to as 'Hard As F*ck' you know it's all going down in Leeds on Sunday. That wraps up this week's preview of the weekend's wrestling schedule. Of course, there are many more events taking place over the three days. To find out more about the shows we've highlighted here as well as all the others coming up soon, check us out at www.wrestleropesuk.wordpress.com for the latest show and match announcements, British Wrestling event list, interviews, exclusive columns, reviews, reports and results!